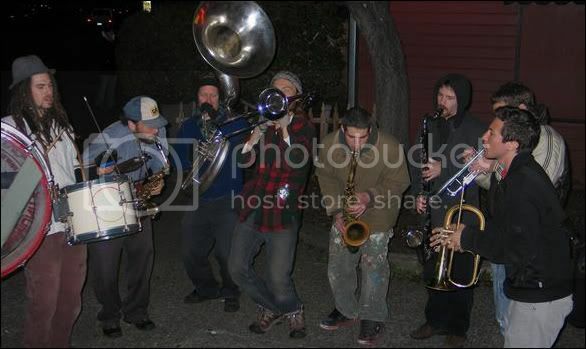 Some of you may already know about Aaron Milligan-Green, the dreadlocked musician who’s been collecting signatures to overturn an outdated and illogical city ordinance regarding street music and who often fills the nighttime quietude with his Jungle Love Orchestra (pictured above). My constituent John Beck has been covering the story on his Press Democrat blog, but since John’s currently honeymooning in Paris, I bring you the latest news. My name’s Aaron MG (a.k.a. The Dreaded Jewbacca) and you might remember me from the Santa Rosa street music petition I’ve put together, the SRJC, or however else we’ve met. Nonetheless, this street music petition I mentioned is part of a campaign to overturn section 17-16.090(A) of the Santa Rosa city noise ordinance, an ordinance which allows the city to fine the people $246 for playing an instrument anywhere at anytime in public. This specific law is only the epitome of a larger issue. As you’ve probably noticed, the streets of Santa Rosa are dead and have absolutely no character or life of their own, yet Santa Rosa is the largest city between San Francisco and Portland, Oregon. This lack of vitality is no mere coincidence, for there are a myriad of laws here to control “unsanctioned” free expression and social gatherings. Did you know it’s illegal to play with a ball or a frisbee, or even have your dog in Courthouse Square, the “Heart of Downtown Santa Rosa?” I’ve actually met people who have been given tickets for playing hacky-sack. It’s a community vs. commerce kind of mentality, masked by a facade of what’s primarily commercial art—and I’m sorry, but we have enough Snoopy sculptures already. By overturning section 17-16.090(A) we hope to put a crack in that facade. But a mere crack will not do. The public learns by example and we want to blow that wall to rubble, so let’s give them a spectacle they won’t forget. We the people need to take to the streets that our tax dollars fund and reclaim them as our own again. THE RENEGADE ART REVIVAL is in full effect on August 8, 2009!! We will take over the downtown of Santa Rosa with street performers and artists of all types in hope of breathing a bit of color back into these beige-aggregate streets. This is all being under-the-radar grassroots organized and it will take every one of us to make it happen. We want at least 500-1,000 or more people out there, performers and supporters alike. And you don’t have to think of yourself as an “artist” or a “performer” per se to come out and participate; one way to take part, for example, is to be active in the costumed bicycle parade. Let’s get 200+ people to come out dressed up in their finest threads and Halloween costumes riding on bikes, while dancers, musicians, painters, jugglers, etc. are posted at every corner, nook, and cranny! Let’s actually use our First Amendment right of free expression and assembly. On August 8th we will meet in Railroad Square at 12 noon and march to Courthouse Square, then from there we will disperse and flood the entire downtown. So spread the word!! There is a Myspace being used to network this whole escapade here, so check it out, sign on, and send others that direction. Forward this email to anyone who you think would be interested. We need everyone to chip in at least a smidgen or two. So on August 8th come one and all to THE RENEGADE ART REVIVAL!! !